Shower Curtain Roller Rings, Shower Curtain Hooks. Glides smoothly, quietly & effortlessly along shower rods. Prevents tears in curtain liners. Imagine no more tugging at the shower curtain. 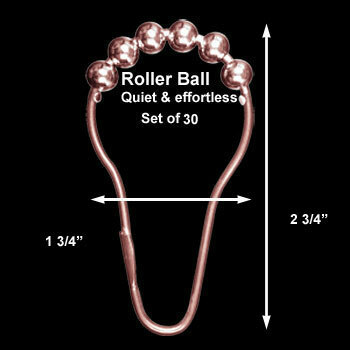 Renovator's Supply's ROLLER BALL Shower Rings have 6 BALL BEARINGS on the top to prevent SCRATCHING the rod. UnlikeRenovator's Supply's competition that sells them with 5 or less ball bearings. Made of Antique Copper Plated Brass. Set of 30. Measures 2 3/4 in. H to fit standard shower curtain rods.